Kristen Pérez, a graduate student in Biology, can talk the talk of the scientist. Amoebae, cytoskeletal proteins, propagation. But she’s learning to tone down the science-speak. Thanks to a classroom of eighth-graders. I like being able to empower children so that they want to learn. Pérez assists Deborah Roll, a classroom teacher at Welborn Academy of Science and Technology in High Point, as part of UNCG’s GK-12 program. GK-12, is funded for five years by a $2.8 million grant from the National Science Foundation. Pérez and Roll are working together to bring more hands-on science learning into the classroom, hopefully breeding future scientists. Pérez is one of nine resident scientists working with the Guilford County Schools this academic year. Pérez and the other residents earn stipends and money for tuition through GK-12. But money is the least of her rewards. 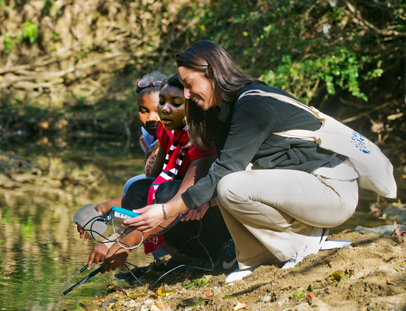 The eighth-graders are studying water quality, which has led them to study the ecosystem in the greenway that runs behind their school. They’re testing water quality, and checking to see if the environment supports microscopic lifeforms, a sign of health. Pérez would like to use dictyostelium as a test organism because it thrives in soil near freshwater systems. Haven’t heard of dictyostelium? She can explain. Her current research involves dictyostelium, a form of amoeba identified by the National Institutes of Health as an effective modelling organism for cancer research. By studying the cytoskeletal proteins that enable cell division in the dictyostelium, she hopes to add to our understanding of how cancer cells divide, and how we might stop them from multiplying. Pérez says several students have already begun taking about future careers in science. One girl wants to be a marine biologist; two other students want to become forensic scientists.